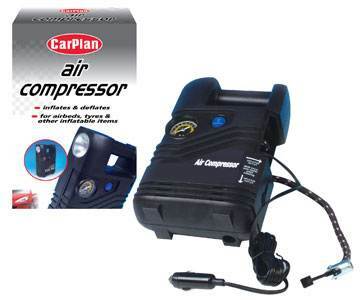 CarPlan Air Compressor is designed to quickly inflate both high volume items such as inflatables and air beds, and high pressure items such as tyres and footballs, just use the most appropriate adapter for the job. Easy to use, just plug into the car cigarette lighter for power, portable self contained case, ideal to keep in the car for emergencies. It has a 3 metre cord length, maximum pressure of 250 PSI, a 12V 8amp power supply, 16mm cylinder and 1800 RPM, and inflates a typical car tyre in 6 minutes. To Ensure correct inflation please follow instructions on item to be inflated. This gauge is only for use as a guide.